Back when life is not so damn hectic. 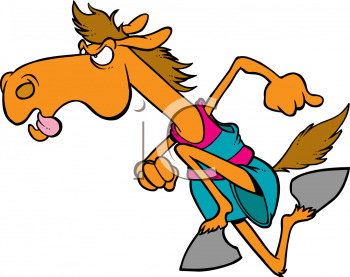 Sorry I am just too busy till early October with all sorts of things. Back when live is not so damn hectic. 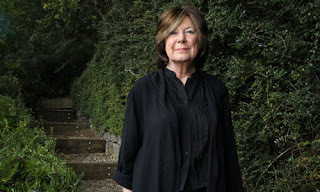 Fiona MacCarthy, author of a previous tome on William Morris, is an expert on Victorian art, sensibility and personalities. She does justice to Burne-Jones’s immense output. Long as it is, her book is never dull. But it is the human drama that keeps one turning the pages. 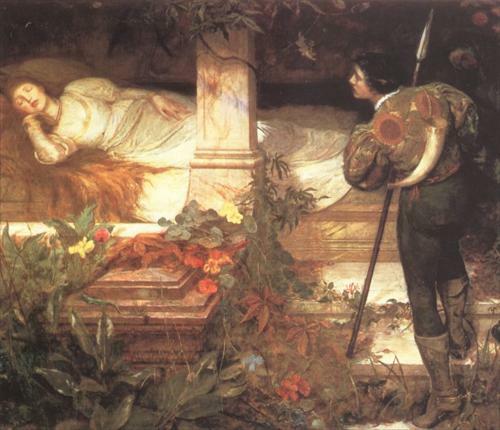 I wish I were more susceptible to Ned’s dream visions of scenes of chivalry and Arthurian legend. But his stunners are indeed stunning. It irks me that I have never come across such amazing women in life. Where were they - those pale, intense goddesses of yearning with their enveloping bronze tresses? 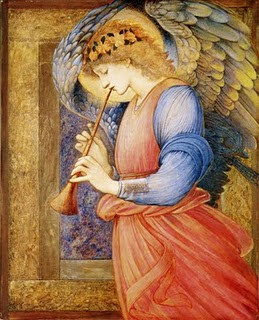 Perhaps - just a suspicion - they never really looked like that except through the fervent eyes and paintbrushes of Rossetti and his chum, Burne-Jones? oak cabinet, comprising a carved scroll pediment above a central recess containing three arched niches and with four ring-turned columns flanked by a pair of panels on sliding doors. The breakfront base with a central hinged panel door enclosing a pair of hinged pigeon holes before open horizontal shelving, above three graduated drawers with carved scallop handles and cast foliate escutheons. These are flanked by a pair of arched doors with rose and oak leaf carved spandrels above turned pillars with foliate capitals each enclosing two fixed shelves and two pull-out shelves. The patent lever locks are stamped G. Harley & Co W. Hampton. The moulded base on shaped bracket supports with recessed trefoil medallions. 13.75 by 44 cm., 53 3/4 by 17 3/4 in. 5. The Procession of Lucifera and her Councillors, canto IV, verses 17 to 36 (top right),13.75 by 44 cm., 53 3/4 by 17 3/4 in. centre), 32.5 by 52 cm., 12 3/4 by 20 1/2 in. overall 157 by 188 by 69 cm., 62 by 74 by 27 in. Traquair was commissioned to decorate a cabinet by Margaret Barbour in the early 1890s. A letter dated 16 May 1890 from Traquair to her friend Willie Moss mentions 'a cabinet keeping me busy just now. Seven panels in which I am trying to get in Spenser story of he Red Cross Knight' (she eventually painted eight panels rather than seven). 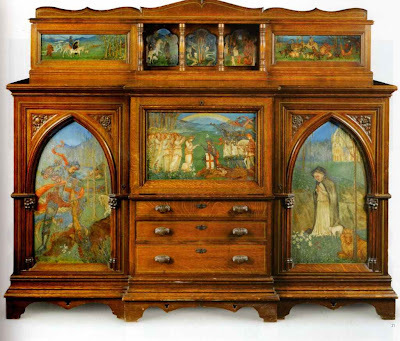 On 9 January 1893 she mentioned that she had begun to paint panels for a second cabinet, but unfortunately did not describe these panels. 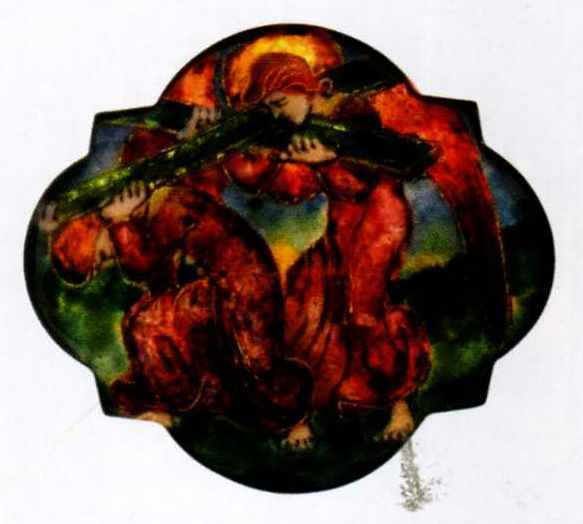 In the catalogue for the Traquair exhibition in 1993, Elizabeth Cummings suggested that the present cabinet relates to the second commission, although the whereabouts of the first cabinet are not known. Traquair had known the Barbour family as early as 1889 when Robert William and Charlotte Rachel Barbour (brother and sister-in-law of Margaret and Hugh Barbour) joined her on a visit to Florence. Traquair had met the Barbours through her friendship with Dr Alexander Whyte who patronised her work. The first of the two large arched panels on the doors of the cabinet, depicts the Red Cross Knight slaying the dragon. 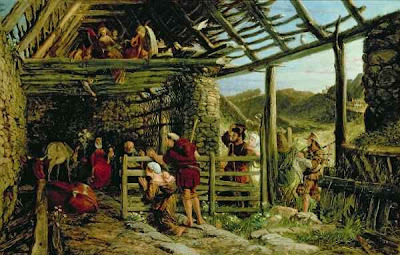 Robert Barbour was the model for the armoured knight whilst the landscape background was painted in the Perthshire countryside close to the Barbour's home. 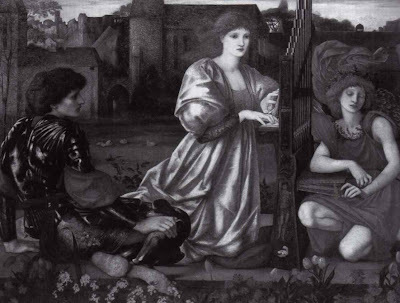 The pose of the knight recalls the various versions of a celebrated composition by Edward Burne-Jones entitled St George Slaying the Dragon. 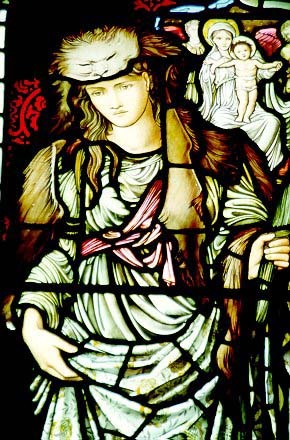 The subjects of St George or the Red Cross Knight were particularly popular with nineteenth century artists as it symbolised heroism and gallantry. 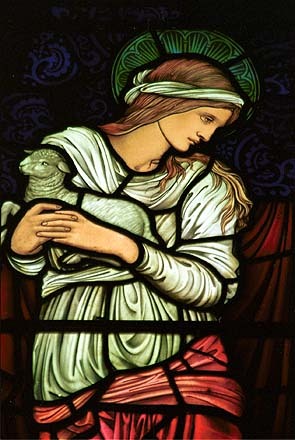 The other arched panel depicts Una the virginal heroine of the Fairee Queen, accompanied by her devoted pet lamb and lion, paying in the garden of Bonskeid with the house in the background. 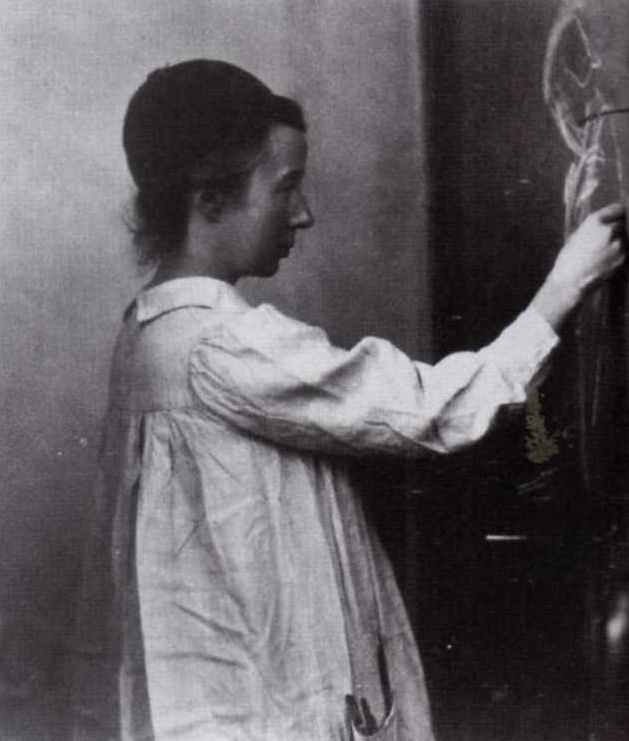 The model for Una was Margaret Barbour. The central panel depicts the marriage of the Red Cross Knight and Una accompanied by the knight's heralds and squire and Una's handmaidens. 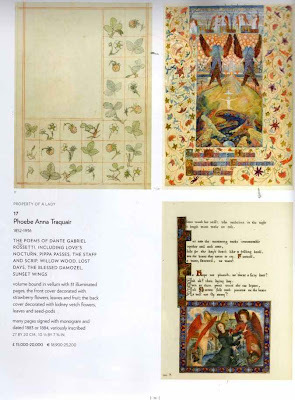 The body of the dragon is laid out in the foreground amongst the spring flowers of the meadow and above the happy group is a radiant rainbow, an element often found in Traquair's work. 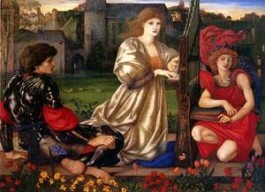 This panel is also reminiscent of Burne-Jones' series of paintings on the subject of St George. radius 3.5 cm., 1.5 in. 4 by 4.5 cm., 1 1/4 by 1 3/4 in. Provenance: Gifted by the author in 1864 to Mrs. William Bruce; thence in 1866 to her daughter Anna Mary Bruce (b.1846); A.H. Martin by 1878. 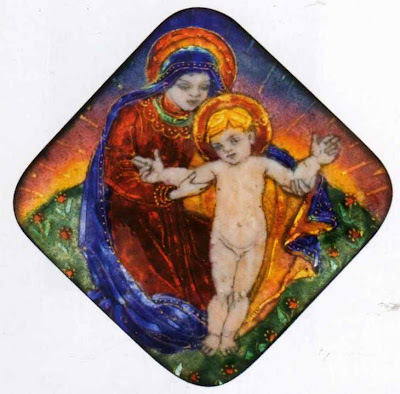 The original recipient, Mrs. Mary Elizabeth née Conybeare Bruce (ca.1818-1866), was the daughter of the Dean of Llandaff & the wife of Canon William Bruce, who in 1869 approved DGR's request to retouch his Llandaff Cathedral reredos (see DGR as Designer & Writer 1889, p.67); she was also the sister-in-law of Sir Henry Austin Bruce, a friend of DGR's since 1856. 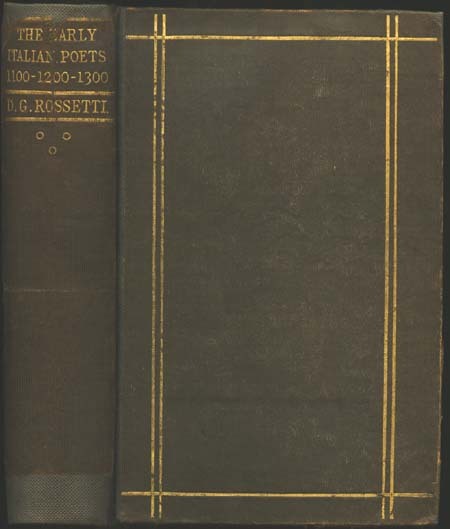 In 1862, in a fit of profound remorse & sadness, DGR buried his manuscript poems, which were to be published as Dante at Verona and Other Poems, with his recently-deceased wife. In Sept. 1869, after being convinced by a few friends that he should publish his lost poetry, DGR wrote to Sir Henry personally requesting his legal consent for Elizabeth Siddal Rossetti's exhumation in order to retrieve his manuscript notebook. This remarkable copy, dedicated to DGR's wife & advertising his forthcoming but soon abandoned edition of poetry, was presented to the sister-in-law of the man whose later consent for the exhumation made such an edition (Poems 1870) possible. signed with monogram and dated 1906 on the reverse and bears an inscription: H. M.
7 by 7 cm., 2 3/4 by 2 3/4 in. 27 by 20 cm., 10 1/2 by 7 3/4 in. As so often with Burne-Jones at this date, the drawing seems to have been conceived as an independent study, unrelated to a picture. 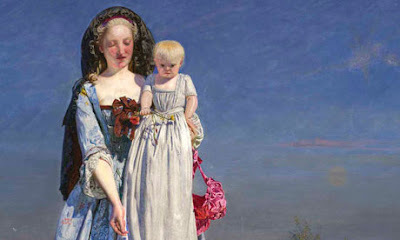 Given his tendency to impose his own visual ideal on his models, it is unlikely that the sitter will ever be identified. 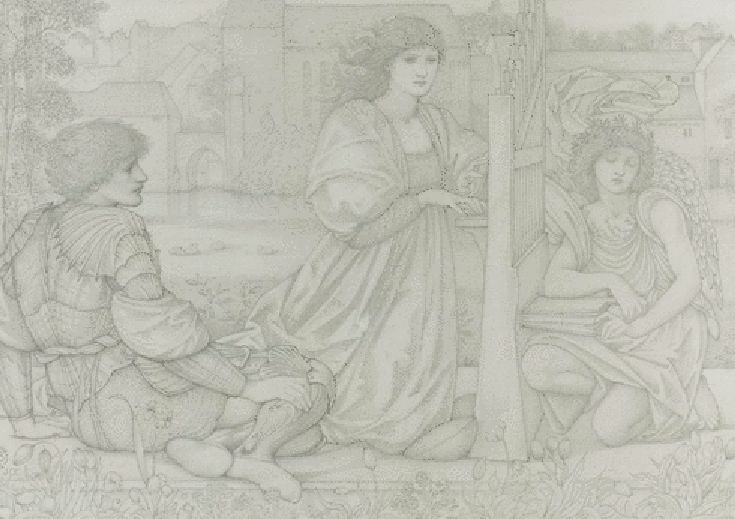 Tthe drawing was in the vast collection formed by William Hesketh Lever, first Viscount Leverhulme, the wealthy manufacturer of Sunlight Soap. 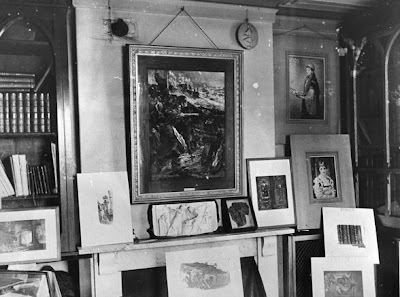 The drawings were given by him to the Lady Lever Art Gallery, Port Sunlight, which he built after the first world war for the benefit of his workforce and in memory of his wife; but they were among many items which were sold by the Trustees at Christie’s in 1958, at a time when Victorian art was out of fashion. PROVENANCE: Thos. Agnew & Sons Ltd; 1st Lord Leverhulme; Lady Lever Art Gallery, Port Sunlight; Christie’s, 6 June 1958, part of lot 23, with P.239, purchased by Gallery. 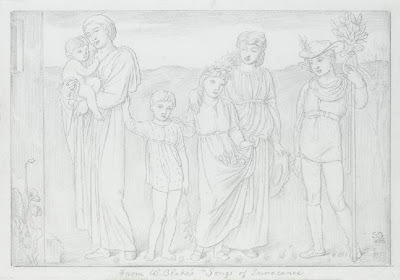 EXHIBTIONS: Drawings and Studies by Sir Edward Burne-Jones, Bart., Berlin, 1898; The English Tradition, Bedford, Cecil Higgins Art Gallery, 1972, no.11; Burne-Jones, London, Hayward Gallery, Southampton, Southampton Art Gallery, & Birmingham, City Museum & Art Gallery, 1975-6, no.322; The Last Romantics, London, Barbican Art Gallery, 1989, no.11. REFERENCE: R.R. 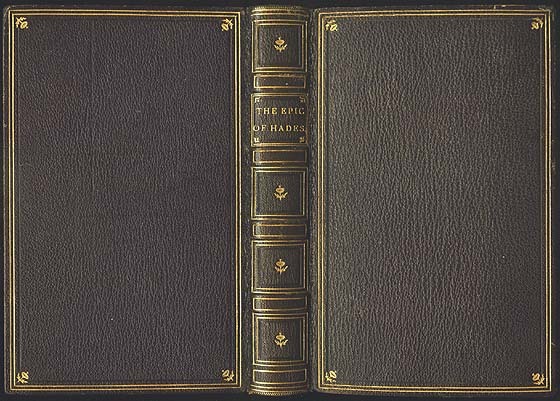 Tatlock, A Record of the Collection in the Lady Lever Art Gallery, Port Sunlight, vol.1, 1928, p.123, no.718. Copyright © Trustees of Cecil Higgins Art Gallery, Bedford. 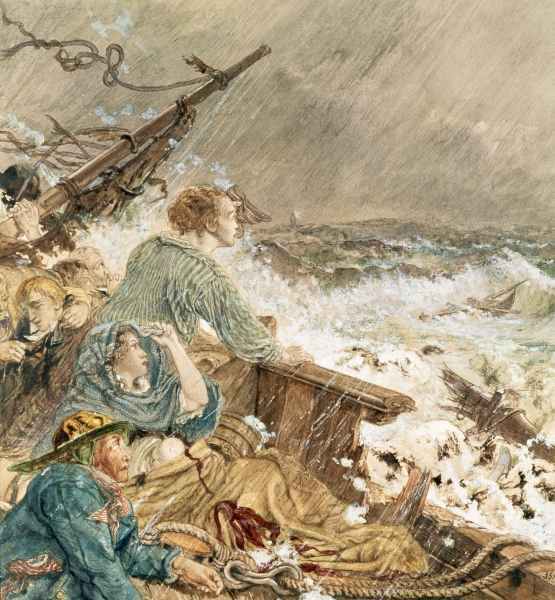 Extract taken from Watercolours and Drawings, Cecil Higgins Art Gallery by Evelyn Joll. 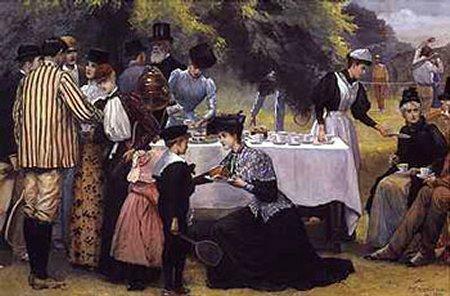 On 14 Oct. 1875 Eleonora (aka Eleanor) Anne Campbell became the 2nd wife of Sir Charles Edward Trevelyan, who inherited the Wallington Estate from Sir Walter Trevelyan in 1879. 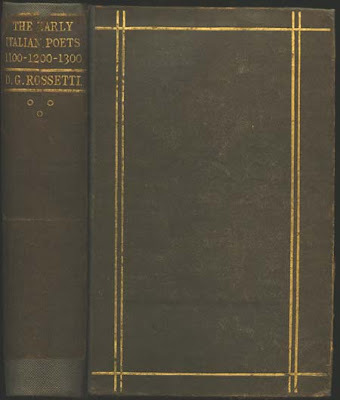 When considering this book's subject, the fore-edge painting of Rossetti's Proserpine is entirely appropriate; the combination of that & the bookplate designed by Bell Scott makes this book a true Pre-Raphaelite association copy. Rossetti & Bell Scott were close friends of the Trevelyans & visited Wallington Hall on numerous occasions. In 1875, Ruskin came to Sheffield to visit a former student. 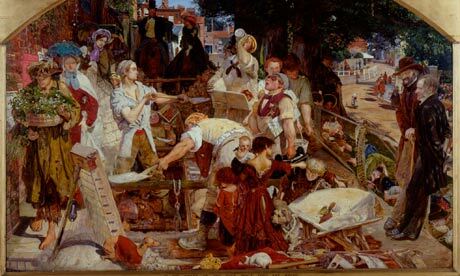 Henry Swan was an engraver whom Ruskin had taught in the 1850s at London's Working Men’s College. Swan had moved to Sheffield because of its reputation for fine metal work. 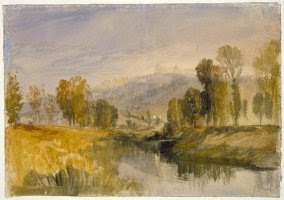 He set up home with his family in the suburb of Walkley. Much taken by Swan's new surroundings, Ruskin saw the opportunity for a museum that would meet the needs of local 'workers in iron' (Works, 28, p. 395). 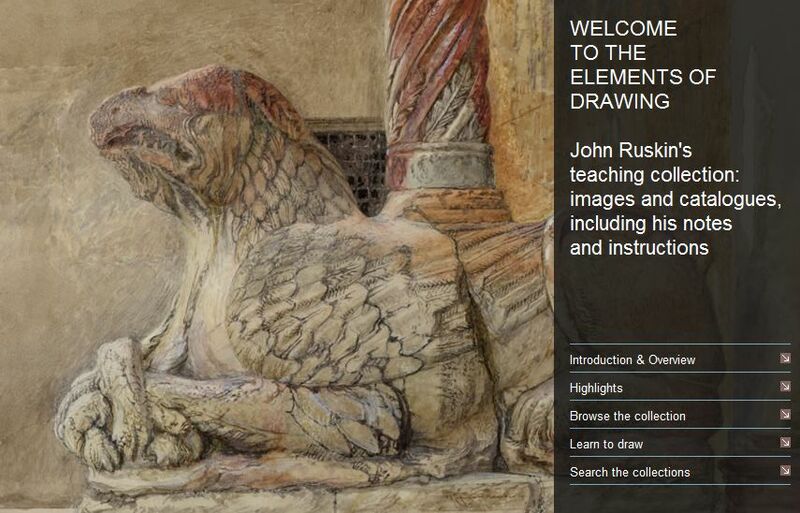 He hoped it would be 'extended into illustration of the natural history of the neighbourhood'. 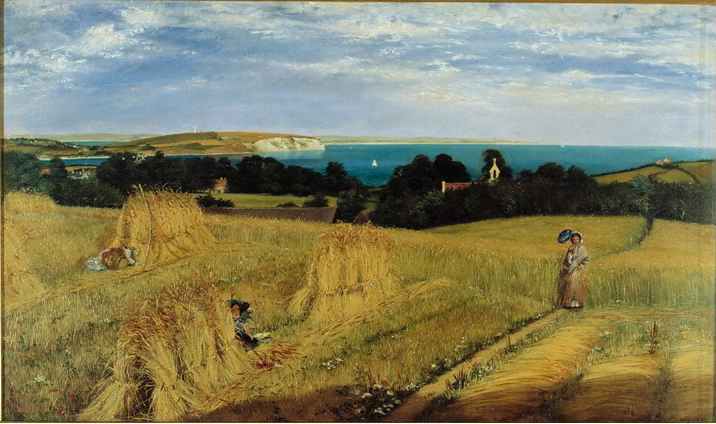 A cottage was purchased for the purpose in 1875, and Ruskin installed his old student in the role of museum curator. 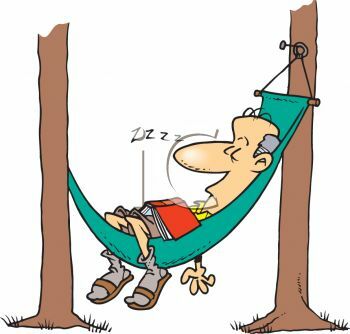 On the original picture on the web site, there are useful hot spots on some of the objects. The more materialistic science becomes, the more angels shall I paint. 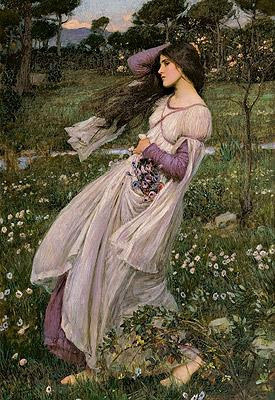 Their winds are my protest in favour of the immortality of the soul. 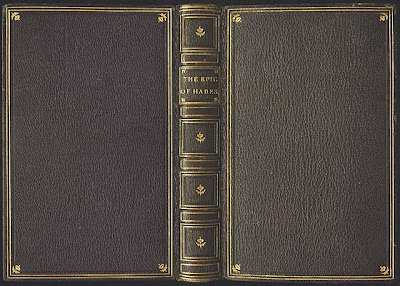 Funnily enough just found my copy of Penelope Fitzgerald's 'Edward Burne-Jones' which at 300 pages is at least lighter to hold! MacCarthy is also probing of his relationships with his male friends, detecting more buried hostility than is usually seen in his affectionate cartoons of "Topsy" (Morris). The result is a rich and thought-provoking portrait. I liked Burne-Jones a bit less after reading it, but admired him a lot more. Tuesday, September 13: Happy Birthday William Bell Scott. 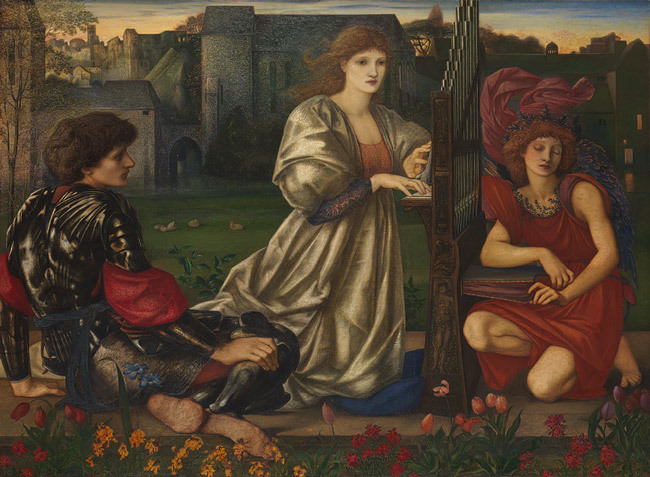 Join Lloyd Langley to celebrate the 200th birthday of the northern pre-Raphaelite William Bell Scott, the artist who created the magnificent paintings of Northumbrian History in the Central Hall at Wallington, and explore his work and influence. At Wallington. 10am–1pm. £20 including coffee and lunch. 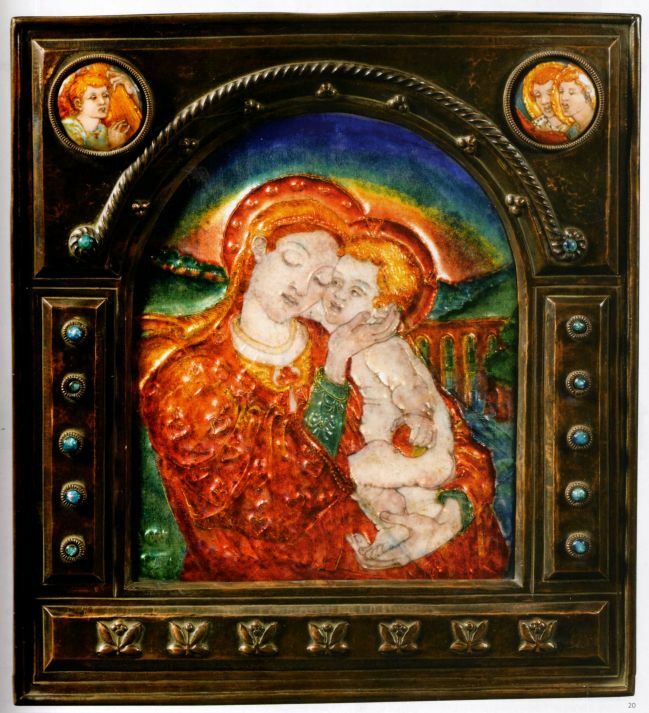 Booking essential, call 01670 773600.
panel 7.25 by 2.5 cm., 3 by 1 in. "To the artist, be he the poet, painter or musician, the world is a great treasure house, stored with endless material for him to use, teach yourself to match the beauty of red-lipped buds, sunlight through green leaves, the yellow gorse on the hill, the song of the wild birds, so on, step by step, the world opens out. This is life. This is to live, the perfection comes when one's own life is in harmony with this beauty"
Thanks to Cathy Baker for finding this. 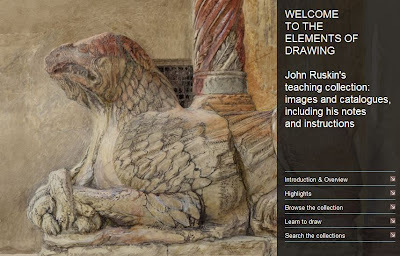 Arguably the most important Burne-Jones in America. "Burne-Jones' The Love Song (47.26), one of the most important Victorian pictures in a U.S. collection, represents a branch of the Aesthetic movement, with its subject derived from no literary source, its dreamy medievalism, and its inspired blend of Gothic and Renaissance prototypes combined with a Pre-Raphaelite intensity of detail and effect. There is a subtle religiosity in the twilight sun shining through the stained-glass windows of the church in the background and falling on the organ pipes. 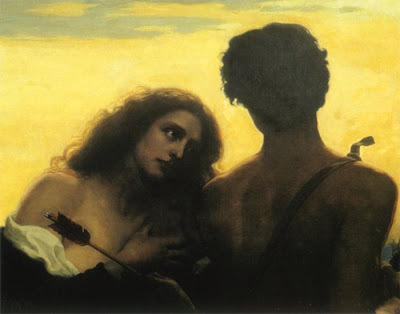 And the contemporary blended conceptions of female and male beauty, as well as literal musicality echoed in the mood, presented both a challenge to traditional historical art and a rarefied transformation of the early concerns of Pre-Raphaelitism. " 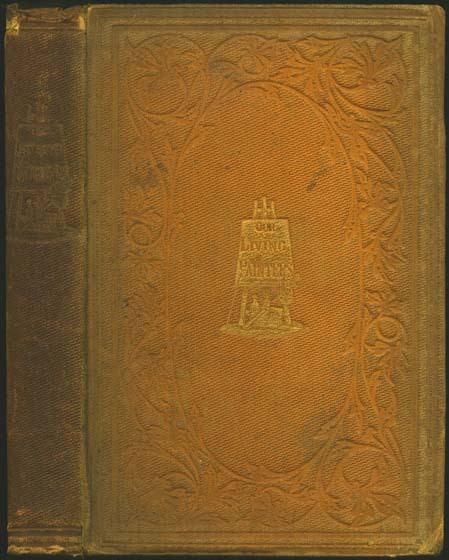 19 by 15cm., 7½ by 6in. 18 by 26 cm., 7 by 10 in. 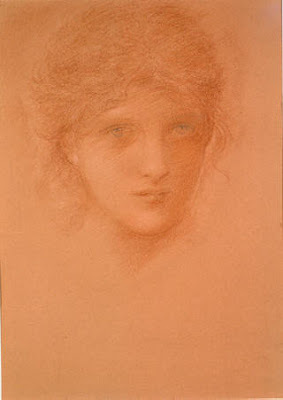 Simeon Solomon was the younger brother of the artists Abraham and Rebecca who were known for their interesting but traditional Victorian genre paintings. 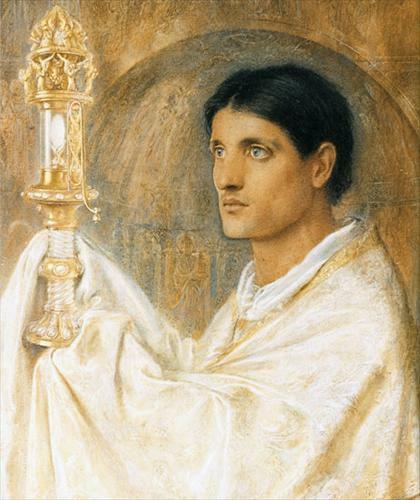 Simeon developed a more visionary approach to art, developed from the paintings of Dante Gabriel Rossetti and Albert Moore and the poetry of Algernon Swinburne, all of whom he was closely associated with in the 1860s. 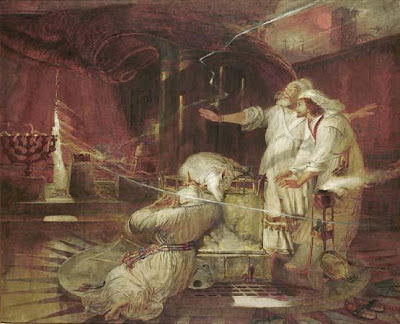 He had studied at the Royal Academy Schools from 1855 and exhibited his first picture at the Academy The Mother of Moses in 1860. During this early period in his life, he was hailed as a genius and much praised for his bold illustrations of biblical scenes, some of which were made for Dalziel's famous bible, and for his drawings of Jewish life and ritual. In 1871 everything changed when he was arrested for lewd conduct and shunned by his family and former friends. He was condemned to a life of squalor in the St Giles Workhouse in Holborn, making money by selling matches on the street. 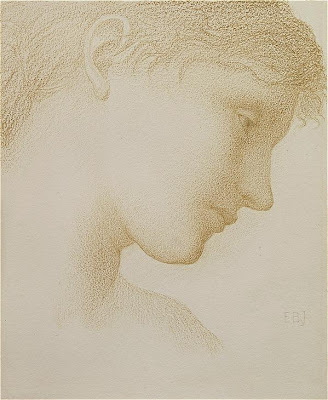 With his meagre earnings he bought artist's materials and continued to draw (usually in coloured chalk) and his work developed a haunting Symbolist intensity. 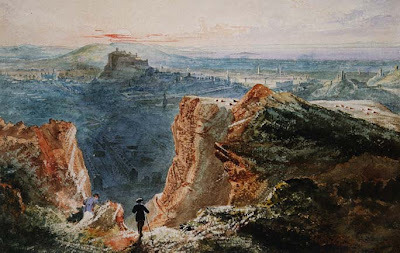 With a few loyal patrons and sympathetic friends, Solomon survived for over thirty years living this precarious life and producing some of the most remarkable drawings of the period. 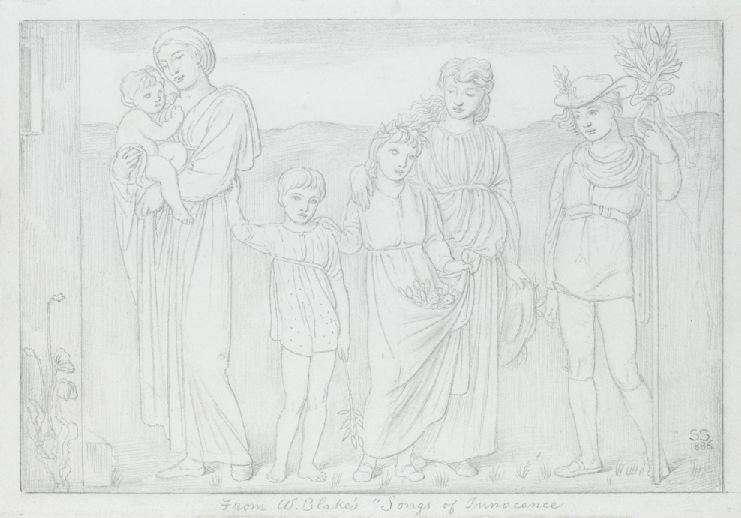 Throughout the 1880s and 1890s his pictures were popular among the undergraduate students of Oxford and the champion of the Aesthetes Oscar Wilde wrote to Lord Alfred Douglas from Reading Goal about his regret at the loss of his cherished drawings by Solomon. 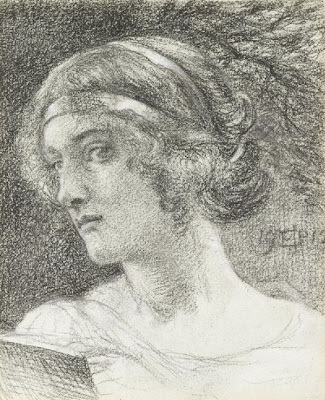 Following his death in 1905, accelerated by chronic alcoholism, his work was exhibited at the Baillie Gallery in London and at the Winter exhibition at the Royal Academy. 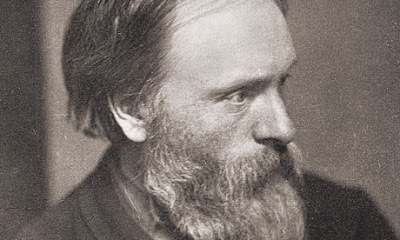 In modern times he has again been judged to be one of the most important members of the Aesthetic movement and in a wider European context, an active exponent of Symbolism. 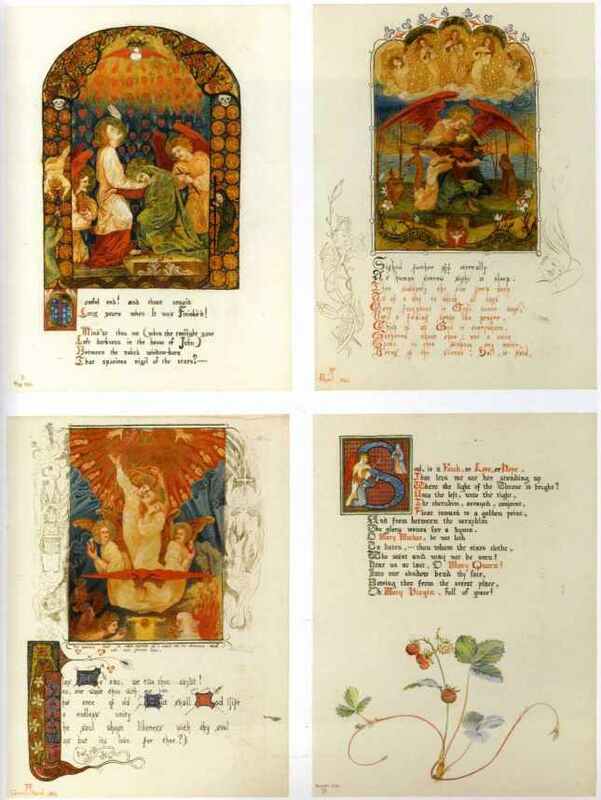 Another illustration of 1886 to William Blake's Songs of Innocence entitled The Vision of the Doubter was exhibited at Birmigham City Art Gallery's exhibition of Solomon's work in 2005. 28 by 37 cm. ; 11 by 14 1/2 in. 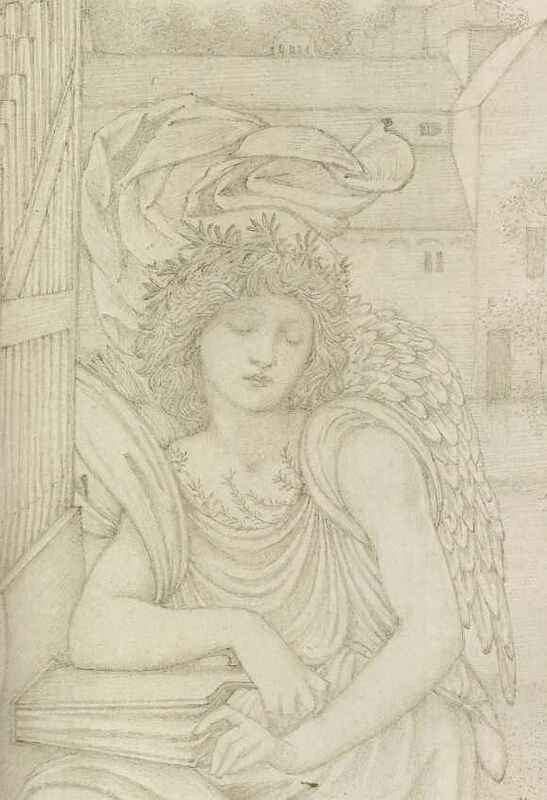 Stephen Wildman and John Christian, Edward Burne-Jones – Victorian Artist-Dreamer, exhibition catalogue, The Metropolitan Museum of Art, New York, 1998, p. 214 note 3. Georgiana loved these old folk songs, and it is said used to sing them to her husband in the evenings when his work was over. The composition in its various forms is loosely derived from Giorgione and the Venetian tradition of concert champêtre. versions and one of the artist's most admired subjects. 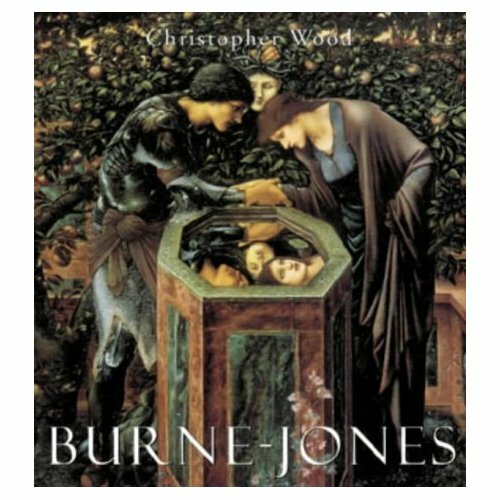 It appeared on the cover of the catalogue of the magnificent exhibition organised in 1998 to mark the centenary of Burne-Jones's death. In 1896 Burne-Jones permitted a reproductive engraving– an etching by the Scottish painter and printmaker Robert Walker Macbeth – to be made of the subject, and which was published by the Fine Art Society. The present drawn version of the subject follows precisely in its treatment of figures and landscape setting the oil version of the subject (in for example the figure of Love, who is seen with his head raised and exposed, whereas in the Boston gouache he is blindfolded so as not to be able to witness the amorousness which may follow and which he had been instrumental in bringing about). Burne-Jones's studio records (kept at the Fitzwilliam Museum, Cambridge) reveal that he had worked intensively on the oil in 1872-3, but that it had then been set aside until 1877 when a month of uninterrupted work was given to it leading to its completion. 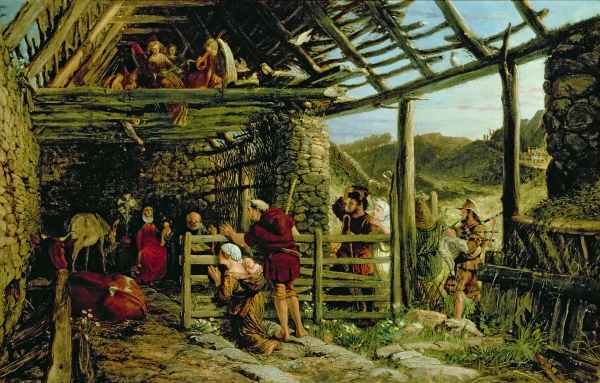 In 1878 it was one of nine works by the artist to be shown at the second Grosvenor Gallery exhibition, lent along with Laus Veneris (Laing Art Gallery, Newcastle upon Tyne), by William Graham. The second Grosvenor exhibition was met with enormous interest, almost equal to the frenzy which had been caused by the first display the previous year, and gave pause for reflection on how a new and poetic school of painting had established in London since the late 1860s, and which has come to be known generically as Aestheticism, but which until the establishment of the Grosvenor by Sir Coutts Lindsay in 1877 had been largely unsuspected by any except the close friends of the artists and a closed circle of devoted aficionados. 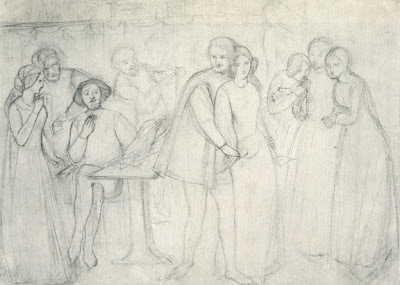 When lent to the Tate Burne-Jones exhibition of 1933 (marking the centenary of the artist's birth), it was assumed that the drawing was a compositional study for the subject in its original state as a gouache from the mid-1860s, and was given the date 1865. 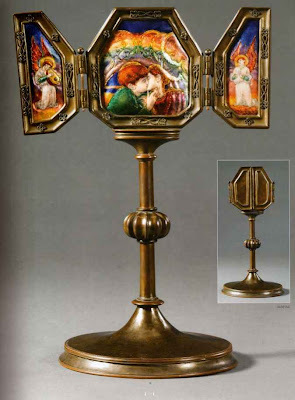 However, it seems clear that it is in fact a replica of the subject (in 1998 John Christian described it as a ricordo (see Literature)), probably made at the time the oil version was finished in 1877 or when it was first shown in 1878. 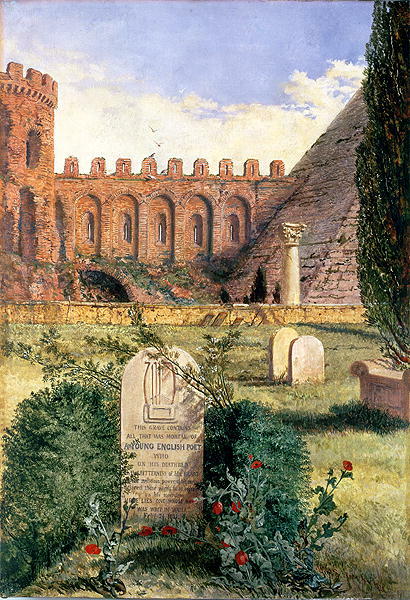 Its inscription, which records its having been given by the artist to his friend Joseph Comyns Carr, is significant in this context – for Carr was one of Coutts Lindsay's assistants in the running of the Grosvenor, and the person – along with Charles Hallé – who was responsible for day-to-day liaising with the artists who were invited to exhibit their works at the Grosvenor. It is therefore tempting to imagine that the drawing was made as a way of saying thank you to Carr for kindnesses and good services to Burne-Jones in connection with the display of the oil version of Le Chant d'Amour. As a presentation drawing of such an important subject made at the time when the artist's reputation was rising meteorically as a result of the prestige and fashionability of the Grosvenor exhibitions, the work may be seen as something very personal and heartfelt.